If you’re not a coffee drinker, you probably just want to skip this one. But if you do like coffee, then boy do I have the recipe for you. Coffee ice cream is actually something I’ve been ruminating on for quite a while, but wasn’t quite ready to take the plunge. I am not fond of the way instant coffee tastes and I wasn’t thrilled at the idea of buying yet another extract. Obviously the ground coffee I already buy was the answer, but it seemed like a more intimidating adventure than I was prepared for so I put it off for several months. 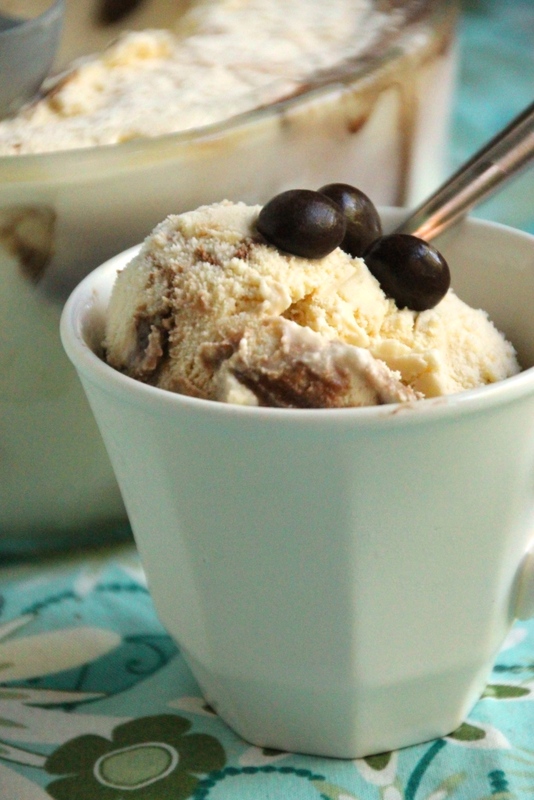 However, the heat wave we had in June reminded me of iced coffee, which reminded me of coffee ice cream, which inspired me to peruse Pinterest for methods. While instant coffee was by far the most common, I immediately wrote off any recipes that employed it. I saw several that brewed coffee milk as the first step, which seemed promising, so I decided to give it ago. Since I typically use half and half in my recipes, that’s what I tried first. Unfortunately it was too thick for the coffee to brew well, and was nearly impossible to squeeze out of the grounds without breaking the coffee filters. Take 2: Whole milk. This worked fabulously and was surprisingly easy. One of my batches I accidentally left brewing closer to an hour. This made it incredibly strong but since I like strong flavors, I was thrilled with this outcome. Feel free to taste test yours at the 30-minute mark and maybe leave it in a little longer if it tastes too weak to you. Bear in mind, however, that it’ll taste somewhat stronger once it’s in ice cream form. This seems counter-intuitive but it’s the experience I had so I thought I would pass on the knowledge. By itself, this recipe tastes like an extra creamy, rather sweeter latte. Very smooth and absolutely fabulous on its own, but for visual interest and to go a bit more the mocha route, I added a small chocolate ripple to my batches. This is absolutely not necessary but it is extremely delicious, so I included the recipe and method for this below. 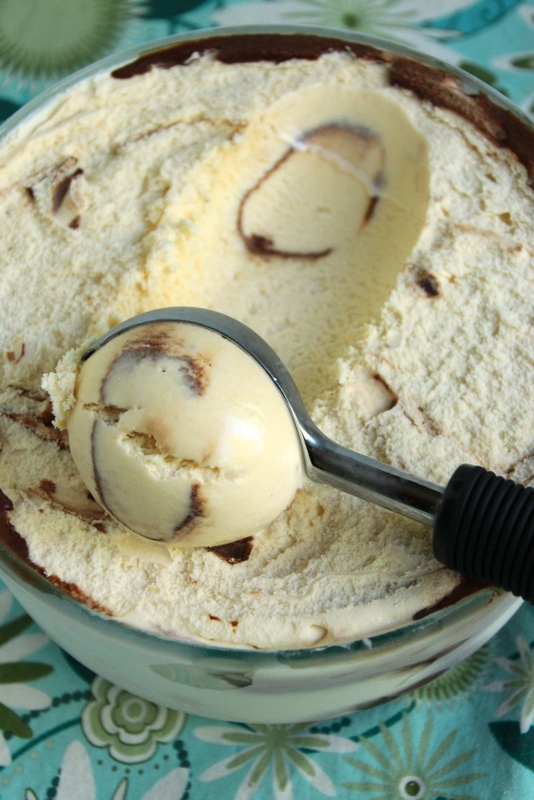 Long-time readers will recognize it from last year’s Peanut Butter Fudge Ripple recipe. Add more or less chocolate to suit your preferences, or just make the recipe to use as a topping on the fly. As a note, I found this recipe froze harder due to its lower fat and sugar than my usual concoction. To combat this, I added a little Kahlúa to my recipe. 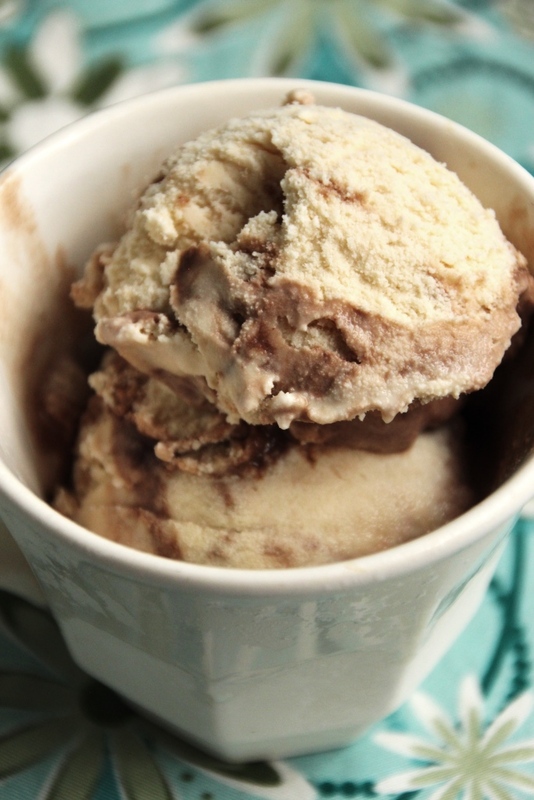 This is 100% optional but makes the ice cream much easier to dish straight out of the freezer as well as kicking up the coffee flavor a notch. You could also use vodka if you don’t want any added flavor, or basically any alcohol or liqueur of your choice. Baileys or vanilla would be a great addition if you want to switch up the experience a bit. Chocolate-covered espresso beans make for a lovely, crunchy topping, as well as giving people a hint to the flavor they’re about to enjoy. If for some reason you’re not a coffee fan but have still made it this far into the post, make sure you check back next week for a totally different taste experience. Place coffee in a sealed coffee filter, cheesecloth, etc. so the grounds don’t get in your ice cream. I used a clip to keep a regular coffee filter closed around the grounds, using one filter per 1/4 cup of coffee. In a small saucepan, heat milk on medium until it just starts to boil, then remove from heat. Place coffee (in filter!) in the milk and allow to steep for about at least 30 minutes. Remove coffee (and any escaped grounds), squeezing grounds gently to release the most flavorful milk. In a large bowl, whisk together remaining ingredients with coffee milk until completely combined. Cover bowl and chill in the refrigerator at least 8 hours, or overnight. Freeze according to your ice cream maker’s directions, then place in a freezer-safe bowl to freeze for an additional three hours, or overnight. 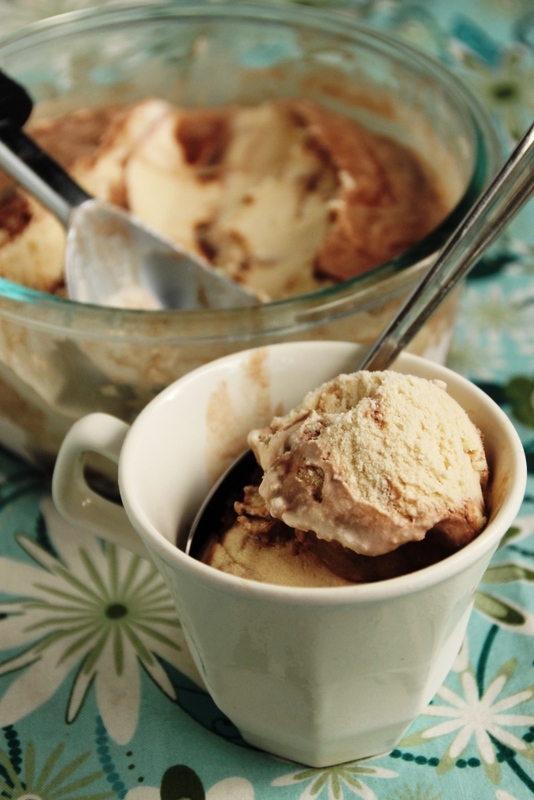 Or follow fudge ripple ice cream recipe below. 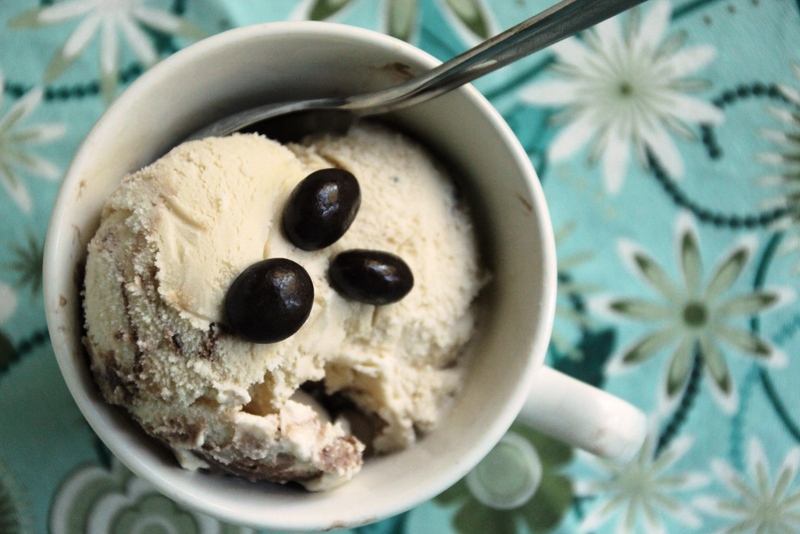 Top with chocolate-covered espresso beans for some extra flair and a little crunch. 1 You could use decaf if you’re concerned about the caffeine at night, I used it in my second batch and it was just great. Regardless of caffeine content, pick a coffee you like to drink since the flavor is very prominent. 2 I found that with the reduced fat and sugar from my usual recipe the ice cream froze a lot harder. The easiest way to fix this is to add alcohol, so that’s what I did. I used 2 Tbsp of Kahlúa which not only kicked up the coffee flavor an extra notch, but made it possible to dish the ice cream straight out of the freezer. If you’re using straight alcohol (e.g. vodka) 1 Tbsp is probably enough, if you’re using a liqueur (e.g. Kahlúa, Baileys) then the full two is probably better. Or, add up to 1/4 cup if you want the added flavoring to shine through. In a medium saucepan, whisk together all ingredients except vanilla. Cook over medium heat, whisking often, until the sauce comes to a low boil. Continue cooking for another minute, whisking almost continuously. Remove sauce from the heat, stir in the vanilla, and let cool in the pot for several minutes. Chill in the fridge for at least 30 minutes before using in ice cream. 1 The quantity varies depending on cooking time, in my experience. I used about 1/2 cup in my ice cream and put the rest in the fridge to use later. You can also freeze it but you may need to take it out for a bit before it becomes pourable. 2 The original recipe calls for Dutch-processed cocoa powder but I just used Hershey’s because that’s what I always have on hand. I used one tablespoon dark cocoa powder and the rest regular. If you haven’t already, place a freezer-safe bowl in the freezer. Freeze ice cream according to your ice cream maker’s directions. Remove bowl from freezer, and drizzle some chocolate sauce on the bottom. Gently spread about one cup of ice cream into the bowl, and top with another drizzle of chocolate sauce. Avoid stirring or the ice cream will look muddy. Repeat with remaining ice cream (you may have sauce leftover), finishing with a sauce drizzle on top. Pro tip: end with just a small drizzle on top or it could mix together once the lid is on. Return bowl to freezer for about 3 hours, or until ice cream is firm.